Hi- It's K.C. again, hijacking Troutrageous! Mike had to fly out of town for an overnight business trip yesterday. Usually Lilly and I have a relaxed time when he's gone....you know - a trip to the McDonalds Playland, playing Mario Cart on wii and stuff like that. Well, things didn't go according to plan this time. Around 10:15pm I was watching The Real Housewives of New Jersey and I saw something small and black-ish scurry across the floor of our kitchen. I stood up and saw - A MOUSE! Panic set in and I immediately ran to the closet to grab a broom. Then I ran outside to see if my next door neighbors light was on. No luck. So I called my friend Danielle and asked her husband if he could PLEASE drive over and assist me. So Dave came over and together we cornered (literally) the vermin and created a "barricade" in attempts to get it out the back slider. We used our kitchen newspaper recycle bin, Lilly's art desk and a board game box. All in all it was kinda easy. I thanked Dave and he left. Little did I realize that the little mouse who had scampered outside so easily had a friend who was waiting for me in front of our refrigerator. I came up the basement steps and went to turn the kitchen lights out- and it looked me right in the eyes and ran under the fridge. It had not been more than 15 minutes since Dave had left, and I felt bad calling him again, but I did anyway. And Dave drove back over. We scoured the kitchen, behind the fridge and under the stove trying to locate the critter but it was no luck. We did find a (sealed) jar of peanut butter, a fossilized package of Thomas' English Muffins, a pretend kitchen knife and a cookie tray that I think we inherited with the house when we moved in. Dave brought over a small snap trap so it was set up with a peanut butter lure and I had instructions to buy sticky traps in the morning. I finally got ahold of Mike around 11:30pm and updated him as to the visitor(s) camped out in our kitchen. I went to bed around 1am, with the lights on and a broom next to me. This morning I had to walk and feed the dog so I got all geared up ready to confront this critter again. I snuck down the stairs in my boots, broom in hand with a ferocious 30 pound pug (who is also deaf and fairly toothless) but there was no morning greeting from our vermin intruder. Lilly and I hit up The Home Depot this morning and procured 8 sticky traps and placed 4 around the kitchen perimeter. Lilly thought it was quite interesting. I think that SHE thinks the mouse is like Gus from Cinderella. If that were the case I'd keep it for mouse labor and help me sew. 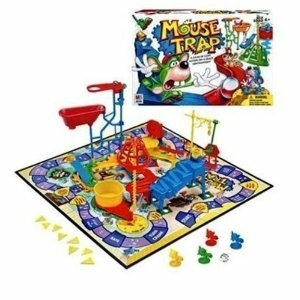 I also kept thinking that my life is turning into a real life version of that Mouse Trap game from when I was a kid. You know- the one that NEVER worked but we still played it all the time. So for now, Lilly and I are making ourselves scarce around the house. She doesn't seem to care at all about the mouse. She even checks the traps to see if we caught anything yet. I on the other had do a visual scan of the entire room every step I take. I jump at every tickle, sound or shadow. I'm getting a little freaked out for when the sun goes down and the house is darker. I really don't want to have to deal with this issue alone again, so let's hope for no flight delays tonight! I recently spent 2 nights sleeping in my truck because the cabin we'd rented ( 4 burly, grown men) had mice in it. I'm not blaming you one bit. Get em out! Last time we had one in the house I woke up to him gnawing on my thumb. I hate any kind of traps (especially sticky traps) because they seem so cruel, but you gotta do what you gotta do. ha! I have a friend who fell asleep by an open window and woke up with a bat on his chest. He had to get rabies vaccinations, so... at least you don't have a bat, right? I wish you sticky traps. Could be worse. The other night I found a beetle in my basement that was bigger than my thumb!!! I chased it around with a hammer until it snuck behind a cabinet. Haven't seen it since. the mouse barrier kills me! Don't be a stranger KC, you're funnier than Mike.